AssemblyTube EasyPlay is a great time saver. Simplify planning, organising and presenting Assemblies. Download, then unzip the contents onto your own USB Stick. Start using your AssemblyTube EasyPlay within minutes. Try the menus now in this live demo. 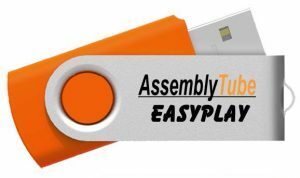 This is the instant download version of the AssemblyTube EasyPlay. Download the EasyPlay software and add it to your own USB drive. If you find a video on AssemblyTube that you like, why not back it up so that it is available whether you have access to the internet or not. Play any type of video file. Never get stuck with a video file that refuses to play. Play videos to your Assembly. Use Assembly Manager to organise what you will deliver and when. Keep details of each Assembly. Record who has delivered the Assembly and to which class. Quick links to all the sections of AssemblyTube. One click and you are there. A complete Office Suite in case you are using a PC without one. A complete Bible which you can search for passages relevant to your Assembly. Want to see what the menus are like to use? Try the EasyPlay menus in action. Your purchase gives you all the files needed to create an AssemblyTube EasyPlay. For ease of download, these files are “zipped” together into a single zip file which you need to unzip onto your own USB stick. If you prefer to have your EasyPlay software already installed on a USB stick? Get This.